As technology advances, old dinosaurs become extinct. Before the days of online shared calendars, there were PDAs. Now, many businesses think a basic shared calendar will suffice. When you run a business, using these archaic devices can leave you left behind and damage your company reputation. If it is just you with one schedule book, it may work, but when you have multiple team members sharing office space and resources, separate schedules can create conflict and even cost you business. That’s where an online scheduling application comes in. Most businesses share the same goal at the end of the day: growth. As business pours in, schedules fill up. This should be a good thing; more customers equal more revenue. However, an outdated or inefficient scheduling system can bring your company’s growth to a grinding halt. Inadequate scheduling procedures can pose serious issues. 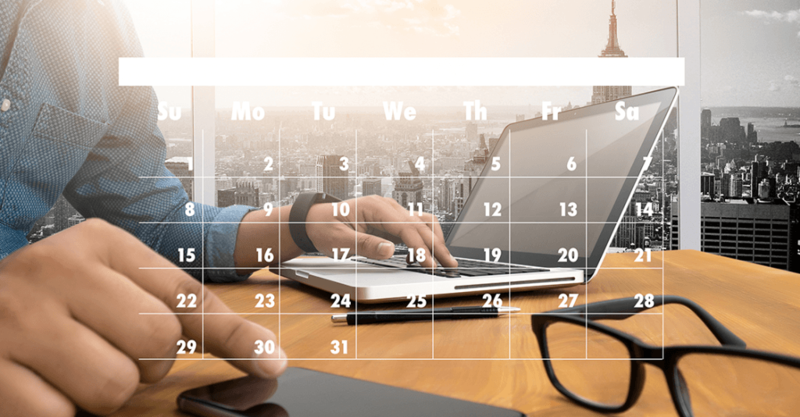 Scheduling Mishaps – When a company has multiple employees, assets, or locations, ineffective scheduling hinders your company. If you have scheduled a specific resource, this needs to be transparent to everyone to avoid overbooking. Performance Inefficiencies – If your scheduling mishaps go unchecked, this will naturally trickle down into performance problems, reducing your revenue-making opportunities. Lowers Employee Morale – If can be frustrating to have your work day bogged down with scheduling inefficiencies. If you don’t give your employees the management organization they deserve, they won’t be able to perform at their best. Image Damage – Not only is your team impacted by poor scheduling procedures, but your company suffers as a whole from image damage. When you have to bump meetings due to lack of time, space and resources, your company inherits labels such as unprepared, unorganized, or unreliable. Even if your team has a shared in-office team calendar, scheduling issues can still arise. The solution is an organized scheduling application has scheduling and workflow capabilities and updates in real-time. That’s why Trinity created an online calendar and scheduler, TrinityCalendar. An online scheduling application gives team members insight into what others are doing and which resources are taken. It streamlines key business processes and workflows, allowing your business to run optimally. Below are just five of the countless unique examples of business processes that can benefit from using an online scheduling tool. If you run a business where you have many field reps, not matter what the type of job, an online scheduling tool is vital. This is especially true if you delegate the task of setting appointments to someone other than the staff member who will be taking the appointment. You need the real time visibility of knowing when each member of your team is available. If a client needs to reschedule, finding another time slot will be no problem at all. Scheduling when you are in charge of teams is even more complicated. When you receive a work assignment, a tool like TrinityCalendar can make assigning that work to the appropriate teams easy. You can also set up recurring scheduled events to work as an automation feature, saving you future time. With this process in place, unplanned absences and other unexpected scheduling needs can be addressed. When managing video production, you have a lot on your plate. From video equipment, to videographers, to locations for editing and filming, it’s your job to make sure everything is scheduled properly. TrinityCalendar can take the chaos out of this task since it’s easily integrated with your other systems and offers easy drag-and-drop features. Make your scheduling process smoother and allow your team to have the equipment they need when they need it. When it comes to transportation management, a lot of people will be impacted if you are allowing inefficiencies and scheduling mistakes to occur. We don’t need to explain how this is bad for your business. With a tool like TrinityCalendar, you can ensure that your customers are getting the transportation they requested on time, every time. TrinityCalendar has many capabilities for those involved in managing a laboratory. This process can schedule both by resource and by equipment. By utilizing your space and equipment efficiently, you can increase your turnaround time and ensure nothing gets double-booked. TrinityCalendar uses cloud-based technology to integrate your scheduling into a user-friendly, informative, and secure platform. This scheduling solution will set your company apart and keep you up to speed with modern technology. Views – You can set your calendar view to different modes. Monthly, Weekly, and Daily. Filters – This is one of the most attractive features of TrinityCalendar. You have the ability to color code to see key information of your scheduled event in greater detail. Links and Buttons – Because the calendar integrates with Quick Base, all your documents and files that are stored through Quick Base app storage are accessible. You attach a link or a button to the scheduled event, and with a click you can pull up the documents needed for your meeting. Popup Modal – A popup feature allows you to see additional information that may not be in the meeting preview. With just a click the details will appear. You can see special instructions or notes you have on your scheduled tasks and assets. Drag and Drop – While the scheduling process is easy in itself, this feature allows you to drag and drop appointment. This is great if you must reschedule a meeting or to duplicate recurring events. Why Choose Trinity’s Quick Base Scheduling Application? Trinity is a business process-focused Quick Base app developer. We work with companies like yours to help streamline business processes like invoicing, document sharing, and scheduling. We care about how your business succeeds. What obstacles are you facing and what frustrates you? What processes are wasting you and your employees’ time? What do you want to spend your valuable time focusing on? We customize your apps to your company niche and where future potential lies. Our top priority is delivering excellent software as a service application programs, like TrinityCalendar, that are seamless to integrate with any current systems you may be using. Flexibility and scalability are integral to our solutions, since Trinity understands that growing businesses evolve over time. For over 21 years, Trinity has worked with clients to improve their efficiency, increase service levels, and upgrade their quality of output.